Tom Snow is CEO of T. J. Snow Company, Inc., Chattanooga, TN, a manufacturer and distributor of resistance-welding machinery, supplies and accessories: 423/894-6234; www.tjsnow.com. Although three-phase mid-frequency direct current (MFDC) inverter-type technology is fast becoming the norm when purchasing new resistance-welding machines, converting existing single-phase resistance-welding machines to MFDC technology has been relatively slow to take hold. 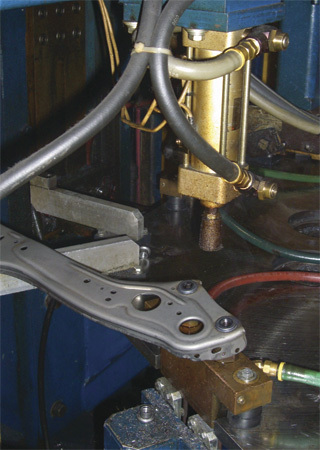 However, savings in cycle time, consumables and power usage can combine for a successful and cost-effective conversion of older equipment, as evidenced by Metrican Stamping Corp., Dickson, TN. Metrican Stamping retrofitted this automated dial-index welding machine with MFDC technology, which delivers more energy to the welds and allowed the machine’s cycle time to be reduced from 9.5 sec. to 7.5 sec., increasing production rate by 101 parts/hr. 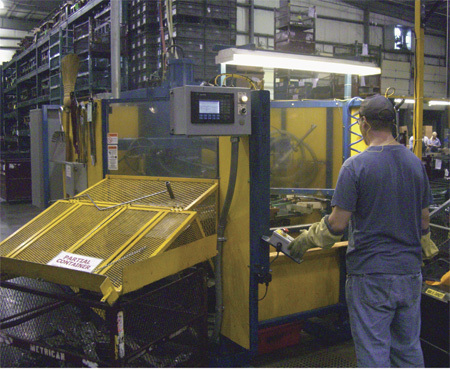 Early in 2009, Metrican maintenance personnel focused attention on problems with a specially designed automated dial-index welder that had come from its Canadian plant. Equipped with a 150-KVA single-phase AC transformer, the machine had proved marginal for the application. 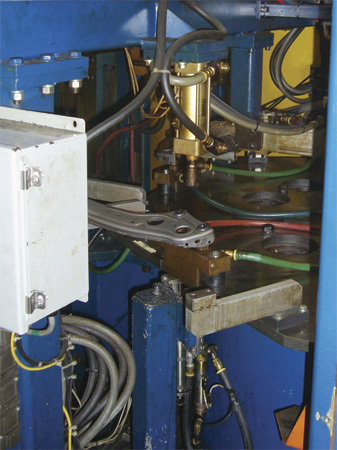 A single-gun machine with a rotary table, the setup was tasked with welding two critical nuts with ring projections to a General Motors seat component, and had been running at maximum capacity for several years. Despite being connected to a large primary electrical service, the aging single-phase welding machine grunted and lights blinked when it fired. In addition, weld quality was not consistent and electrode life short. Excessive weld times were necessary to compensate for the borderline welding amperage available from the machine. As a result, brazed-on Elkonite tips (tungsten-copper alloys from CMW Inc.) of the welding electrodes sometimes fell off. The problem finally came to the forefront when compressors in the office air-conditioning system began to fail, and the company attributed the breakdowns to the voltage drop occurring every time the welding machine fired. While relatively low-cost single phase AC resistance welders remain more common than MFDC inverter technology in U.S. plants, and conventional single-phase transformers and controls can be more robust in some applications, the added efficiency of using three-phase mid-frequency DC current can be dramatic. In addition, a metalformer applying MFDC technology to a new installation can realize significant savings over the cost of installing utilities to serve single-phase machines, since smaller three-phase electrical switches and wiring can be used. The single-gun machine resistance-welds two nuts with ring projections to a General Motors seat component. With the previous AC welding system, electrodes were only good for about 40,000 welds; the new MFDC system enables the machine to run 200,000 welds prior to an electrode change (although just to be conservative, operators change electrodes after 150,000 welds). Annual expenditures for consumables has dropped by more than $10,700. At Metrican Stamping Corp., the existing RoMan single-phase 150-KVA 60-Hz welding transformer was replaced with a new RoMan 320-KVA, 50-percent-duty cycle, three-phase MFDC power supply operating at 1000 Hz. In addition, the existing welder control was quickly converted with an MFDC retrofit kit (from Medar, a division of WTC). Although the MFDC transformer is rated at 320 KVA, it’s physically smaller and lighter than the 150-KVA single phase-transformer it replaced, yet produces more secondary amps at a lower primary draw. The purchase of a centralized, self-contained water chiller to cool the machine—and several others in the plant—also contributed to the success of the project. MFDC transformers and controls are more susceptible to failure due to low water-flow rates and excessive KVA demand. Although significantly more expensive than comparable single-phase AC resistance-welding components, prices of transformers and controls used in MFDC welding machines have dropped somewhat, due to economies of scale. RoMan Manufacturing’s Don DeCorte, vice president of sales and marketing, reports that MFDC power supplies represent more than 60 percent of its welding sales, confirming that the multiple advantages of MFDC systems are offsetting higher costs. In addition, DeCorte reports that some local utility companies offer financial incentives if customers install the electrically efficient MFDC units. Metrican Stamping personnel carefully documented the before-and-after variables of the conversion, and the results are impressive. With the previous AC welding system, electrodes were only good for about 40,000 welds; the new MFDC system enables the machine to run 200,000 welds prior to an electrode change (although just to be conservative, operators change electrodes after 150,000 welds). The facility was able to replace the Elkonite-faced upper electrodes with less-costly Class 3 copper, and life of the copper lower-electrode bases and locating pins increased from two months to nine months. Annual expenditures for consumables dropped by more than $10,700 due to the lower initial cost of the electrodes and increased life. MFDC technology, which delivers more energy to the welds, allowed the machine’s cycle time to be reduced from 9.5 sec. to 7.5 sec., increasing production rate by 101 parts/hr. Weld quality has greatly improved as well, with welds of the 7⁄16-in.-dia. ring projection rarely failing the 5800-lb. destructive test. The machine’s primary current draw has dropped to an average of only 300 A/weld. Following the retrofit, Metrican Stamping’s welding machine has produced more than 2.4 million parts, and more productivity-improving moves are on the . To further increase production of the seat component, Metrican plans to add another rotary-dial index welding machine, equipped to weld both nuts simultaneously without a gun shift.